Every year around the 1st of October we have a christmas launch party in conjunction with our sister shop, Antique Rose. While this may be too early for some, it’s never too early to take advantage of a ‘3 for 2 offer’ and support a local charity, while sipping on Prosecco and listening to live Music from local entertainer Danny Mountain! We always donate 10% of the evenings’ proceeds to our charity. This is a ticketed event as demand is high but tickets are free and loyalty card holders get a free gift or goody bag with their purchase. In 2018, the event was a huge success and together we raised £300 for our local charity Wokingham in Need. watch the video of the night here!! We hold other events and shopping evenings and will be introducing Wine & Design evenings where Georgina will give interior design talks over a glass of wine. We also hold courses and workshops for those interested in furniture painting using our vintage chalk paints. Watch this space and our social media pages for more information. 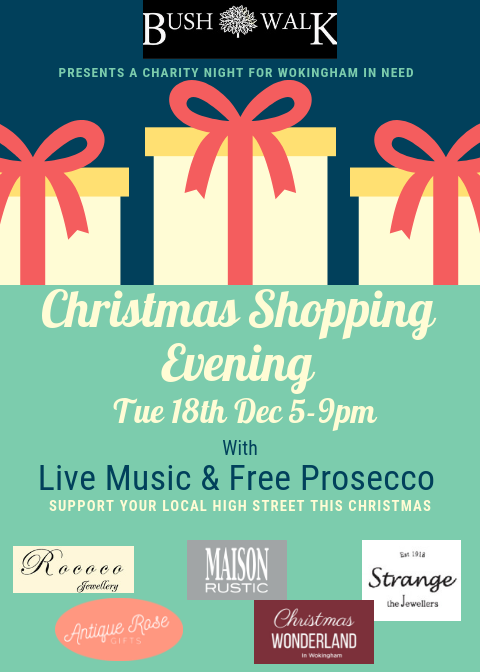 Christmas Shopping Evening 2018 – Tuesday 18th December 5-9pm Our annual Christmas Launch is always so popular but so early we like to bring the festive cheer back a little closer to christmas. 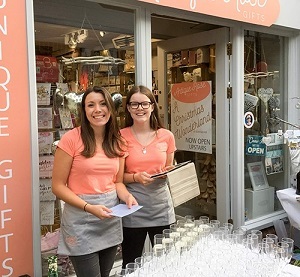 In conjunction with the other shops in Bush walk including our sister shop Antique Rose, we will have our usual live music from Danny Mountain, free Prosecco and free gifts for our swipii loyalty card holders. Not to mention you get to see all our gorgeous Christmas stock and all the new home shop ranges too!! Feel free to bring the little ones as this is becoming a family event or alternatively make it a girls night out. Tickets are Free but places are limited so make sure you get your free ticket here!! Our business is always looking to support the community and the high street where possible. Georgina has been heavily involved with the local Town Team and is now a member of the local Business Association. 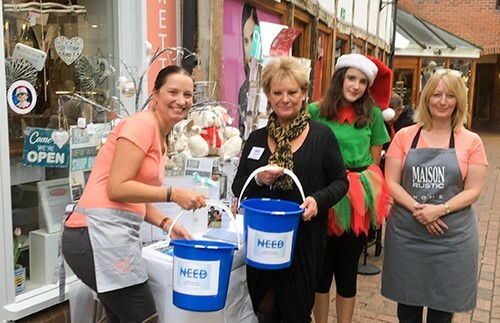 We also look to raise money where we can for local charities such as Wokingham in Need (WIN), who focus on helping vulnerable and homeless people in Wokingham. It really is a charity that is at the heart of the town and Wokingham’s community and the Christmas spirit at our recent Christmas Launch Event raised a staggering £700 for the charity on the night. We like to get involved in local community events and are proud hosts of the Living Advent Calendar, 24 live performances around the town every day in December at 6.15pm put on by Moore Arts and the Town Council to raise money for local charities and provide arts and culture in the town. We also support the local fireworks display, organised by the Lions, and will be selling programmes in the weeks running up to the event. We are always happy to donate Raffle Prizes where we can to worthy local causes.